"Abby Barnes had a plan. The Plan. She'd go to Northwestern, major in journalism, and land a job at a national newspaper, all before she turned twenty-two. But one tiny choice—taking a drama class her senior year of high school—changed all that. Now, on the eve of her eighteenth birthday, Abby is stuck on a Hollywood movie set, miles from where she wants to be, wishing she could rewind her life. The next morning, she's in a dorm room at Yale, with no memory of how she got there. Overnight, it's as if her past has been rewritten. As she struggles to navigate her ever-shifting existence, forced to live out the consequences of a path she didn't choose, Abby must let go of the Plan and learn to focus on the present, without losing sight of who she is, the boy who might just be her soul mate, and the destiny that's finally within reach." First line: "I hesitate, then point my gun at him and pull the trigger." Thoughts: Originally, I thought to compare PARALLEL to a roller coaster ride. There are loads of twists and turns, leaving your head spinning, your adrenaline pumping, and your insides screaming for more. To do this would be an understatement. 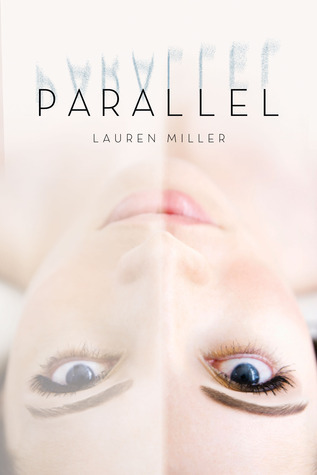 PARALLEL is more like a skydive. It's a freefall, an act of faith. You throw yourself into the abyss and hope fate (and Science) will lead you safely to the ground. Are you intrigued yet? Great because you should be! First off, I do have to warn you that this book can get rather confusing. Please, for the love of cupcakes, read the title of each chapter carefully and pay attention. You don't want to get lost in the Parallax! The beginning of the book begins with Abby filming on the set of the movie Everyday Assassins. While this would be a dream come true for 99.9% of most girls (and boys), it's not Abby's. From the get go, you can tell how truly unhappy she is and how much she wishes terribly that things were different. The choices she made didn't lead her down the path she wanted. The girl had a plan and this wasn't it. It isn't until the night of her eighteen birthday that everything changes. What people thought to be an earthquake was actually a shift into another reality. Everyone remembers these false memories and this false life. Everyone except Abby. One of the things I loved about this book is how the author created not one but two main characters in the form of Abby herself. You have the Abby who remembers everything and slowly gets glimpses into these false memories she doesn't remember living, and then you have parallel Abby who doesn't realize there's a whole other reality out there. Here and there Abbys (Abbies?). While I adored parallel Abby and her innocence, I must admit that "here" Abby was my favorite. She was very take charge and didn't accept things just because that's how they are. Instead, she made choices and turned them into how she wanted to live her life, who she wanted to be, and who she wanted to be with. I respected her for that. Now, one of the things I found interesting in this novel were the details the author puts into these universes. It's not like other books, how things just happen and you're forced to accept them. Miller provides a professor to the reader in the form of Dr. Mann. There's a theory and an explanation, and I loved every minute of it. There's also a best friend and guide in the form of Caitlyn. She helps Abby fill in the missing pieces of her life and basically helps her in every way a best friend should. Now, if there were only a solution to this mess. Oh, and we have to talk about the boys! So, in many ways this book has a bit of a love triangle in it. There's Michael and there's Josh. The thing is, the love triangle really isn't a love real triangle. It's hard to explain, and you just really have to read it to understand. To say the least, it's quite interesting and riveting. Out of the two boys, I have to say that Michael, no Josh, no Michael...no Josh...was my favorite. Yeah, to be honest, I can't choose between the two. They're both sweet and funny and downright adorable. It's like choosing between your two favorite cupcake flavors. Do you go with pumpkin or red velvet? You can't so you order both and feel guilty later! I will say that there were so many moments where I couldn't help but feel bad for these two guys. They both love Abby so much and between parallel and "here" Abby, they must be confused beyond comprehension. I mean, heck, I was the reader and I was confused! If having two extremely charming boys to love is a crime than lock me up and throw away the key. I get goosebumps just thinking about them. My only complaint about this novel is the ending. The last two pages nearly destroyed me, and I had to reread my favorite scenes to get over it. It's not necessarily bad nor tragic or devasting. It's just one of those frustrating "WHAT?!" moments that makes you want to throw the book into the fireplace. Overall, I recommend PARALLEL to those looking for something exceptional and different to read. I heard several people complain about the grammar issues in the ARC, and I have to point out that I believe this was resolved in the final print. I didn't have this problem so it didn't affect my reading experience. Some may complain that it's too hard to follow. I feel the need to counter this with the fact that there's still an amazing story in there. You just have to concentrate and go with it. The romance will have you and your parallel swooning to the moon, the stars, and back again. "When you make sense of the chaos, the chaos disappears. Or maybe, what looked at first like chaos never was." "And though I want to say more – how magical and significant this feels, how deeply I’m moved by the music, how honored I am that he shared this with me – I don’t, in part because I don’t want to interrupt the silence but mostly because I know words won’t be enough. So I touch my lips to his cheek in a soundless kiss – a silent thank-you – then sit back against the wooden pew, letting the music and the darkness envelope me." "I want this. This moment. This reality. This life." I think the book would be perfect for me. And also, if its an Arc, I think that's why there are grammar errors, it's not the final copy. Duh! And hmm, the ending has me curious. I wonder what's going to happen. I loved this book(and your review!). I read an ARC and didn't really notice grammatical errors, but maybe I just wasn't paying attention? And YES, you definitely have to read the chapter titles. I skimmed over them at first and was very confused for about half of the book until I realized I would be a lot LESS confused if I had read them.